The 21st is always an interesting birthday, as it involves both a rite of passage and an occasion to party. The 20th marks the end of the teen years, but the 21st is more of a beginning to the younger phases of adulthood. At 21, many people are preparing to finish at University, and many others are starting their first permanent jobs, or moving away from home. This makes this a very important birthday, and one worth celebrating in a big way with friends and/or family. You know the basics: gather a fun crowd, set up a fun event, and start drinking! 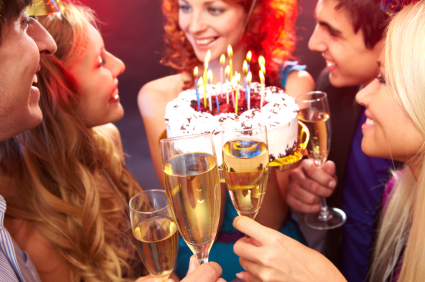 But here are a few specific ideas for ways to make the 21st a special birthday. Drinking and congregating can occur anywhere, and you can easily hit the bar scene later on in an evening. This is why one great idea for a specific birthday party is to set up a nice, well-organized dinner party. This might mean renting out part of a nice restaurant, involving a catering service, or simply setting up your home for a beautiful and entertaining dinner. This is a good way for you to dress nicely and enjoy your friends in a more formal, celebratory setting before you head out for the night. Perhaps the most common way for people to celebrate birthdays is simply to go out to bars and clubs, drink, and dance together. However, if you want to create a more unique experience for your birthday night – so it’s not just like any old weekend evening – consider renting out the top floor of a club, or some other sort of venue, for a more private dance party. You can still invite enough friends to pack the house, but having your own space set aside means this is just a party for you, and not an average night out. With the right venue, a good music list or entertaining DJ, and a guest list full of your friends, you can have an incredible dance party that everyone will enjoy, and your 21st can become an event to remember. If you really want to set the bar high with your 21st birthday, you can start exploring ways to bring in performers or celebrity speakers through MN2S or a similar booking agency. This may seem like a reach, but in reality there are certainly booking agencies capable of bringing a legitimate star to your home or venue to help you celebrate your 21st with a private concert or speech. No matter what the venue, this will create a lasting memory and a very special 21st birthday celebration.